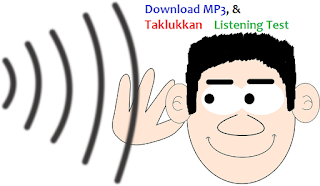 Listening Bahasa Inggris - Download listening bahasa Ingris SMA SMK dan MA lengkap dengan audio MP3, transcript, dan soal UN dari tahun 2004 sampai 2015. Dalam update ini, blog listening bahasa Inggris ini telah mengusahakan beberapa file MP3 nya mempunyai kualitas sound lebih baik dan tetap berukuran file kecil. The easiest way to increase the listening section skill is practicing more and more. It meas we need to listen more and more the audio file material for the previous national exams. Listening test is commonly considered as the most difficult test among English skills test. Fortunately for National exam in senior high school just presented listening and reading section, excluding speaking and writing. However, most students need hard study, hard exercise especially for listening section test. The following materials in MP3 files of listening section from previous National Examination (UNAS/UN) are free to download. Hopefully the MP3 of listening section of UN/Unas can help student’s preparation better for next exam. As all known, recent national exam for high school includes listening comprehension and this is commonly found as difficult one by high school student. By having listening as often as possible, the difficulty in listening section hopefully can be reduced. The listening exam in English for high school and vocational high school (SMA/MA and SMK) is little bit different however it does not vary much. The test in listening is divided into several parts (three or four parts). Each part will have different direction. For example, part one will consist of dialogue and question which are not printed in test paper then in the test paper will be found several responses. For part two, both question and the responses are not printed in the test book. In part three contains monologue followed by the questions, student should choose the best printed answer based on the monologue. While for Vocational student (SMK), commonly the test in listening consists four part which slightly similar to high school students. The different will be seen in the part three which consists of short dialogue followed by several responses which should be chosen as the best answer. Feel free to download the following material of listening section from previous tests in SMA/MA and SMK. Hopefully these help students preparing themselves to pass the next final exam. For students who want to study question of those listening test, see the test books (soal) below! For those who wants to read the scripts (transcript) of the audio tape, see below! For students who would like to see the test books (soal), see below! For those who wants to read the scripts of the audio, see below! Download listening bahasa inggris dan teksnya. Silahkan didownload MP3 listening test ujian nasional SMA, MA 2004-2015 dan SMK 2006-2015. Karena ukuran file MP3 nya relatif kecil, sehingga cocok untuk di putar di HP, MP3 player, and other portable MP3 players agar bisa mendengarkan listening dimana saja. Makin sering mendengarakan materi listening, makin baik kemampuan listening bahasa Inggris nya. Pada posting yang lain, ada beberapa artikel untuk soal-naskah listening, trascript listening, tips dll. Thank for the link to download the mp3 listening section material for sma. I would like to appreciate greatly for the great work. Hopefully it can help lot students to prepare national examination. Thank you so much for the link. It's very useful. listenig udah download terus soalnya mana admin? the newest of listening UN smk/sma 2012, please!! thx..
Who makes this? Thanks anyway. It,s gonna be useful 4 us, hopefully. baru nyadar pas ujian dulu (2009) speakernya yang cewe logat India banget, n yang cowo British banget. aneh juga, yang diomongin tentang 'pergi ke sekolah', tapi yang ngomong suaranya kayanya umur 30-an. lebih bagus kalau speakernya juga remaja gituu..
sangat membantu dan makasi utk free download nya. semoga blog ini tambah sukses dan banyak memberi manfaat bagi semuanya.. brovo!! A great blog! I've downloaded some of the files provided on this blog. Thank you and keep up the good work. Thanks lot for your listening section mp3. May God bless you for ever. thanks for the uploaded listening materials; we used those in our learning and teaching process. where is the key answer with the complete explanation? min, link nya mati kok min? tolong aktivasi kembali link nya.